Blackpool-based company, Review Systems, specialising in building and managing a nation-wide advertising network uses digitalsignage.NET to manage its screens in various locations across the UK. With digital displays in motor dealership, insurance brokers and finance offices and more than 120 clients nationwide, the company generates revenues exclusively through advertising, so it needed a reliable solution for managing its operations. update and schedule ads straight from their offices and monitor the network remotely, without having to travel to the location of each individual screen or mail SD cards. 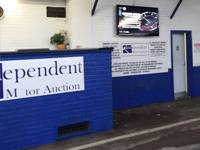 Yorkshire-based motor dealership- Independent Motor Auctions is the first beneficiary of the system. Samsung LCD screens (of 32” and 41”) powered by IAdea’s XMP – 130 wireless players and run by digitalsignage.NET have been installed in the show room and reception area displaying adverts of cars and other location – based messages. —Read our recent case- study and discover how cinemas in England and Scotland use digital signage solutions run by our digitalsignage.NET and provided by Review Systems. This entry was posted in and tagged advertising, digital signage advertising, digital signage software, retail digital signage by Dynamax. Bookmark the permalink.